So you guys remember how much I loved The Goddess Test? I'm a Greek mythology geek through and through and proud of it :) So I can't for the life of me understand why I waited this long to read this beautiful sequel!! 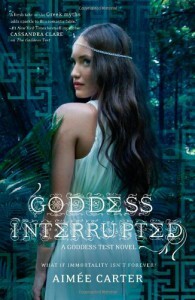 It took me a little longer to get into Goddess Interrupted than it did The Goddess Test, but Aimée Carter weaves such a wonderful tale that I couldn't help but fall in love with the characters and the world she's created all over again. Kate is still the wonderful main character I remember from The Goddess Test. I loved how brave she was, even though some of her actions were sort of ill-advised, she never crossed over into the too-stupid-to-live category. I could easily imagine making the same choices. I was so proud of her for repeatedly putting herself out there with Henry when she didn't get much encouragement from him. She was genuinely trying to work on their relationship and I applaud the girl for not running off when things get hard. And Henry, beautiful broken Henry. The Henry I'd gotten to know and love in The Goddess Test was a bit absent in Goddess Interrupted, but in the end he showed up and it was epic... I love him, he's a flawed character and he doesn't always make it easy to love him, but I do just the same. What I love so much about Aimée's storytelling is that I'm RIGHT THERE with Kate. 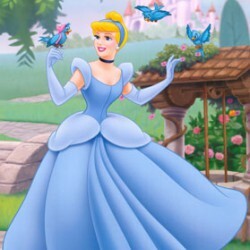 I'm there when she has doubts and when she feels lonely and despairs if Henry will ever love her like she loves him. And I cried SO HARD. I mean, I'm used to getting tears in my eyes at heartbreak, cause I'm a big ol' sap, but there were tears streaming down my face, TEARS EVERYWHERE! It was so, SO good! And OMG! THE CLIFFHANGER ENDING! I was going NOOOOO! You can't leave me like this!! I'll have to wait over half a year for the next book!! It will be excruciating! I had not seen that coming. AT ALL. So thank you, Aimée Carter, for sharing Kate and Henry's story with me and the rest of the world. Thank you for making me fall in love with them and just feeling ALL THE THINGS! Seriously, ALL THE THINGS! I think I can even forgive you for that ending, somewhat.